Healing Touch Chiropractic is an alliance of healthcare professionals, including Battle Creek chiropractor, Dr. Stephany Poindexter. 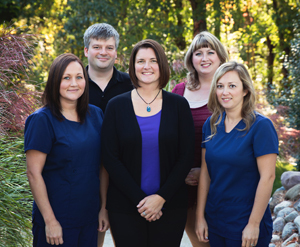 We are dedicated to providing the highest quality chiropractic care and massage therapy for the entire family. The goal in our office is to educate and empower our patients to make conscious life-enhancing health choices through a chiropractic lifestyle. Ready to get started? Please call our Battle Creek chiropractic office today to arrange a time so that we may meet you and discuss your particular health issue. Well beyond expectations. Being a larger person, Dr Poindexter was able to manipulate me without any issues, treated my issues with great care and already feel better from being properly cared for. Her staff is wonderful, kind and entertaining. Your needs will be met here. I really appreciated the extra time and attention I received, because I was conscious of it….but it’s helped me to not shop around and just commit to you, thank you again. I had all my questions answered and Dr. Poindexter has a great bedside manner about her, keep up the good work! Would recommend Dr. Poindexter to anyone. She’s the only one that has been able to help my neck on the one side and walk out of there feeling great. The therapy is wonderful also. Very relaxing and Angie has found spots that I didn’t know I had. Great job ladies. I have been to various Chiropractors in my 63 years and have happily found Dr Poindexter to excel in knowledge, and skill when manipulating areas needing attention. Happy and cheerful attitudes abound! Love coming to Healing Touch Chiropractic. Everyone is so friendly and helpful. I had never been to a Chiropractor before, so I was pretty nervous at my first visit. Dr. Stephany took her time and explained each adjustment and what to expect. Now I look forward to my next visit! Love coming to Healing Touch Chiropractic. Everyone is so friendly and helpful. I had never been to a Chiropractor before, so I was pretty nervous at my first visit. Dr. Stephany took her time and explained each adjustment and what to expect. Now I look forward to my next visit. I have never been to a Chiropractor before and from the moment I entered the door I felt very comfortable. Everyone that I’ve met has been great! I felt amazing after I left and would totally recommend Healing Touch! I was very impressed with the chiropractic care I received. In fact, Dr. Poindexter did a MUCH better job than our previous chiropractor! I’m now glad that when we moved, we needed to find a closer chiropractor! Really felt she took the time to listen. Her techniques really are superior! I am feeling better today after my first visit. Last night was my first full night sleep since 2 weeks prior due to my pain.So glad I was able to be seen. Great staff! The staff was very professional and caring. Great experience. I can’t begin to tell you how much we love your office. Everyone is so professional and caring. Thank you so much.